since september 10, 2005, i have attended five weddings including my own; two of which were held this month. 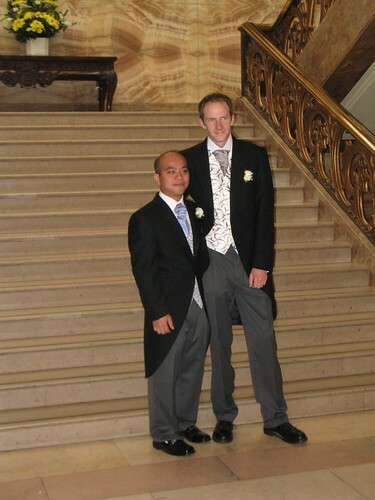 and next, his friend r married t at camden town hall. both ceremonies were lovely. our ceremony at new york city hall went so fast that it felt like it was over before it started - we were genuinely grateful that s's dad videotaped it, because we barely realized it had happened. "then i pronounce you husband and wife. you may kiss the bride." on the other hand, getting married in the u.k., even in a registry office, seems to be punctuated by more pomp and circumstance. both registrars started with an introduction explaining the solemnity of the vows. at p & i's civil partnership, the registrar was careful to avoid calling it a "marriage" as such, but still emphasized that their choice to publicly declare their love and commitment to each other was no less legally binding. both couples exchanged vows and rings. tissues were on hand for the happy tears. the couples and their witnesses signed the register - in r & t's case, they even had to write down their occupations. you did get the feeling that they were adding their names to a long history of couples who had tied the knot there. both couples put on good parties afterward. there was plenty of fruit cake and champagne. p & i opted for a three-week road trip honeymoon through nevada, california, oregon, washington and vancouver. r & t headed for the sun in morocco. the wedding season is over for now and some of my other happily married friends are accommodating our need for frequent celebrations by moving into babyland. it all feels very ...thirtysomething... recently! look for more pix of both ceremonies, and a's video of r & t saying their vows, by clicking on the links below.